Dictionary Settings are on the Dictionaries tab of the Translation Settings window. 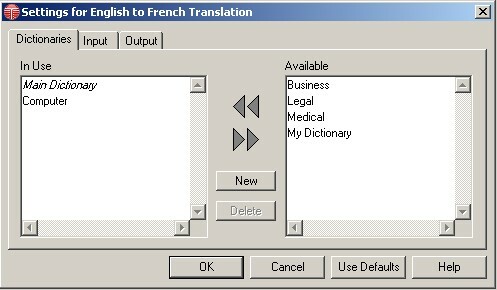 The Translation Settings window can be opened from the Language Chooser menu, or from the Translation Options menu, which is usually found on the Tools menu. Subject Dictionaries contain industry-specific specialized terminologies. Available subject dictionaries are listed on www.lec.com. Subject dictionaries are available for Business and Pro products, as well as Premium Translate DotNet subscribers. Choose the dictionaries to use for translation by clicking on the dictionary and using the left and right arrows to move it between Available and In Use. The main dictionary is italicized because it is always used, and is permanently in the In Use list. Press on the Use Defaults button to restore the default setting, which is usually with only the Main Dictionary In Use. Create User Dictionaries to add words and translations not already in the main or subject dictionaries. User and Subject Dictionaries usually increase the accuracy of translation. User Dictionaries are created and edited with the Dictionary application, included with LEC Pro products. Create a new user dictionary by pressing the New button in the Dictionary Settings. 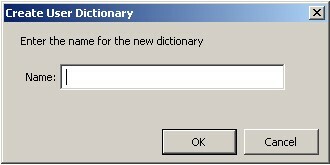 This displays a dialog to name your dictionary. User dictionaries are like subject dictionaries, and you move them between Available and In Use in the same way as subject dictionaries.